Spinning Flag Pole Kit Includes: 3x5' US Embroidered banner with sewn stripes, embroidered stars and pole sleeve. Adjustable mounting bracket. 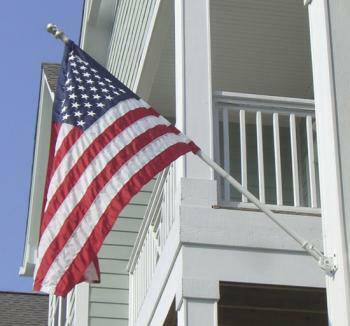 6' X 1" Deluxe Spinning Flagpole that keeps the flag from wrapping. The top section of the pole rotates on ball bearings so the flag hangs free. This is the best home American flag pole set available. The NFS Spinning Kit comes standard with a white spinning pole and white adjustable bracket. Please enter notes at checkout or contact us by phone if you would prefer silver pole and silver bracket. Adjustable Aluminum Bracket - White 1"
White Spinning Flagpole - 6' x 1"